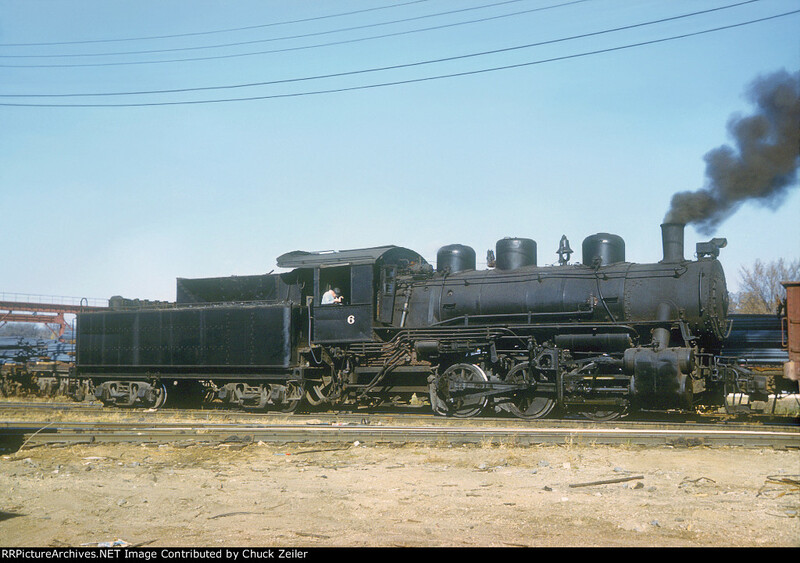 Northwestern Steel and Wire Class G-5 6 at Sterling, Illinois on November 11, 1958, Kodachrome by unknown photographer, Chuck Zeiler collection. Built in 1919 by the Cooke Works of the American Locomotive Company (Alco) as CB&Q class G-5 506, it was one of ten USRA design 0-6-0's (CB&Q road #'s 500-509) allotted to the Burlington during World War 1. All ten lasted into 1953-1954 when they were sold for scrap to Northwestern Steel and Wire (NSW) located in Sterling, Illinois. A few were in good enough shape that NSW put them to work hauling cut up steam locomotives from the scrap yard to the furnaces, this one, former CB&Q 506, became NSW 6 by painting out the 50. Once melted, the locomotives became wire products, and in some cases the wire products became nails. Among the railfans, it was said that there was a steam locomotive in every box of NSW nails. Eventually the Q 0-6-0's were in turn cut up and hauled to the furnaces by GTW 0-8-0's which were sold for scrap to NSW.